So, you can crawl for long distances, can easily hold a plank, and can practically do the “bird dog” exercise in your sleep. This is all great. But how well can you crawl while dragging something? Have you ever tried it? 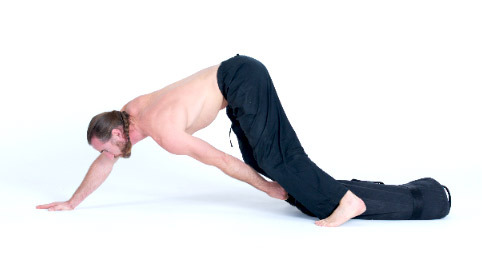 It’s a bit harder than your standard hand and foot crawl (aka the “bear crawl” exercise). But it’s eminently practical, and provides a lot of unique fitness and conditioning benefits. Now, unless you literally live in a cave, you’re probably wondering why you would need to perform this movement during everyday life. We’re glad you asked. Sometimes, life presents us with a difficult situation that requires adaptability in order to succeed. So, imagine you are in that cave, tunnel, or basement, on that battlefield, in that smoke-filled house that’s on fire, or anywhere else where you can’t stand high with a load on your back or carried in front of you. The truth is we can’t always move and perform in perfectly controlled environments where we have plenty of space, ergonomic equipment, and air conditioning, among other comforts and conveniences. So, in this situation of needing to move an object without much room overhead, one option you have is to go for the foot-hand crawl drag, which is one of many techniques for dragging something. This a very practical movement. And of course, all the functional movement specialists out there would point out how great this is for “core” strength, too! Equipment needed: something to drag on the ground, such as a backpack, a ragbag, a sandbag, a purse full of gold and diamonds, or a small log and a piece of rope. It works best if the object you have to move has a handle, or a way to grasp it strongly. Step 1) Assume a foot-hand crawl (aka “bear” crawl) position, feet at the same level, legs bent, one arm in front of you and lengthened. The other lengthened arm is reaching far to the back between your legs, hand firmly grasping the handle of the bag. The handle should be approximately aligned vertically with your hips. You should be on the balls of your feet, heels off the ground, for optimum position and friction. Step 2) Push off your feet and legs, driving your whole body forward. Notice in the photo how your head gets closer to your front hand, the trail hand passes in front of the feet, while the arm holding the bag stays fully lengthened. Step 3) Now the motion will come from the hips dynamically moving forward and down (as the upper body leans upward), which drives the whole body even farther forward. Using the forward motion created by the hips, simultaneously pull the back arm forward, dragging the bag to its farthest forward point. Your head and shoulder are now vertically ahead of the front hand. Notice that it is the position of the body in relation to its base of support (feet and front hand) that has changed. Whereas, the position of the feet and front hand on the ground have stayed strictly the same. Secondly, the pulling arm was never bent, but used the power from the legs and hips to drag the load. Step 4) Move your feet and arm farther to the front, then resume at step 1 (photo 1). Alternate arms each time, or after every few dragging motions. Drag for a longer distance, drag faster, drag something heavier, or drag something heavier faster for a longer distance. Drag on an inclined or declined terrain, like the slope of a hill, or on sand, or ice, mud, stone, asphalt, etc. Change the object’s size, shape, or weight distribution. To make it more difficult, you can also lengthen the distance between the load and the handle, for instance by tying up a piece of rope to it. The longer the distance between your handling hand and the load, the more difficult it gets. Did I mention this was great for core strength? The reality is that you probably won’t need to perform this movement as often as you walk or carry something during your everyday life. So, is this a movement that you should practice every day? For most people, probably not. But it’s a good idea to practice this occasionally not only so that you can use the technique if you ever need to, but also to incorporate variety into your movement practice and claim the many benefits of well-rounded, “real world” fitness that comes from practicing the full spectrum of natural human movement skills. So, if you’ve got the hand and foot crawl down, then try the hand and foot crawl while dragging an object for a fun and challenging change of pace.